Doji Hoturi and Shinjo Yokatsu got gender swapped! At last those funny feelings Hoturi gave me are all ok! If they still want Hotaru to have a romance with Kachiko I'm all in! 1. fights arent "winner take all" or "Break or bust", instead the Ring Rewards and how you use them will be far more important then always trying to swing to destroy provinces. 2. The way they represent honor as a resource that can be spent on card advantage is interesting and gives me hope for the Shadowland Hordes when they inevitably arrive. 3. Honor being spent for cards is something that will make Honor running decks very interesting, I'm currious how easy reaching 25 actually is. 4. The Gold scheme concerns from the last game seem to be the bigest change they wanted to tackle along with the snowball effects of losing out to early aggression meaning games will inherently be longer. Crab will be holding orientated with defensive tactics. Crane seem to be about honor skills and winning conflics by movement abilities. Dragons are going to be attachment based and lean towards voltron charecters over armies. Lion are aggressive swarm with a clear weakness to courtier conflicts. Phoenix will be about defending your provinces but being able to lose with less consequence by denying your opponents the victory rings they will try to use. Very control oriented. Scorpion will be about trading honor for card advantage and manipulating the direct skills and powers of your enemy's cards. Unicorn will be a mobility and aggression themed faction. So overall many of the factions seem the same or familiar concept wise. The scorpion and phoenix seem to however be getting modifications based on mechanic changes and are looking to be the most different. Scorpion seems to be about dishonoring yourself to gain advantage, notably card advantage, while attacking the enemy's personalities honor, not necessarily the opponent's honor. They seem to focus on not losing by droping to 0 for yourself, not in forcing your opponent to hit 0. 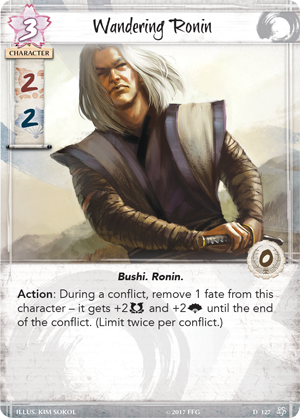 Maybe they are moving the dishonor strategy away and supplementing it with this new card advantage side. Phoenix seems to be about denying your opponents from province breaking while also denying the win rewards from rings. A very interesting take. This could really represent the Shiba/Isawa bond perfectly but its sounds like a cool control theme for the clan. Shadowlands are not in this, but we are described as marching towards the Carpenter Wall with Kisada needing aid badly. We ARE coming guys! So its Clan Wars again which means that we will see awesome stuff. The story intro sets the stage for the Phoenix opening black scrolls and Shoju is set for his coup. I'm hoping for Yogo Junzo and his amazing hordes again! I LOVE that dishonorable actions relate to in game advantages, the possibilities of how a faction with no care for honor handles this will be really cool. The Fate system keeps personalities low, with an emphasis on a few heroes and supporters. I REALLY hope that since this will fill the discard we can have reanimator strategies and abilities, bringing dead personalities back into play. Scorpion are introduced using dishonor to net them advantages and de-buffs to personalities, not intentionally making the opponent reach 0 honor, meaning that we might be seeing the end of Dishonor as a mainline win condition for scorpion, removing potentially one of our biggest hurdles for the future. Also cards that require you being high or low honor as well. This is looking really cool guys! I also like how the layout of the card is designed with the art being big and in center, really makes them look amazing! This feels like a slight adjustment and its pretty close to how I imagined this all going down. Mechanically there are huge swings, but visually and emotionally it feels very l5r. Fantastic post. Thank you, man. the game looks super interesting. can't wait to dig deeper into it. also looking forward to being one of what i'm sure will be about 400 people in the AMA tomorrow asking when/if mantis and shadowlands are getting factioned. Shadowlands certainly will. The amount of design space open for them is certainly going to be a factor. The whole reason the Mantis existed was because Hoturi and Kachiko had a thing, and their son Dairu died during the Coup, which caused mad Kachiko to Egg Hoturi, and real Hoturi paid the Mantis tons of cash to fight the False Hoturi, which allowed Yoritomo to have the resources to form his Alliance and eventually absorb them. They've excised Hoturi from the storyline, so that whole catalyst is now gone. Girltori and Kachiko can certainly still have a romance, but I don't think they're going to have a love child because of it. That said, the story person did say that they were "re-imagining, not re-telling" the old story, so it's possible things like the Mantis and the Spider Clan won't even exist anymore. They also said familiar faces will show up but perhaps not in ways or situations we would expect. Basically, L5R has been USS Kelvin'd. Last edited by Tetsuro on Wed Apr 19, 2017 5:46 pm, edited 1 time in total. Girltori and Kachiko can certainly still have a romance, but I don't think they're going to have a love child because of it. That's what the Egg of P'an Ku could be! That said, the story person did say that they were "re-magining, not re-telling" the old story, so it's possible things like the Mantis and the Spider Clan won't even exist anymore. They also said familiar faces will show up but perhaps not in ways or situations we would expect. Could this be the Order of the Spider/Venom? I'd also bet on something like Fudoism rather than Order of Venom stuff. But I don't know that they would do Fudoism the same way. I suspect that they are going to make the Kolat, if they exist, basically just the yakuza without all the nonsense about sleeper agents and magic rock cellphones. Could be the same for Fudoism. Honestly, I have a hard time really seeing how the Shadowlands fits into the mechanics they've laid out without being given their own special set of mechanics and rules that work just for them, and I really don't think FFG wants to go down that route. I mean, I'm not sure but I don't think they gave the White Walkers their own faction in AGoT, did they? yeah, i definitely get this concern, but they mention the shadowlands like, A LOT. like five times. and i don't think the white walker thing is a clean parallel. but its a good question to ponder. maybe something on the stronghold like "any time you would normally lose honor, gain taint. lose the game if your taint ever hits X. you surrender your soul to Fu Leng." the taint score is something that cards can key off, and high taint is useful, but it puts you close to losing, and since it functions like honor loss, dishonor cards can target you. On the other hand, they DID make the Tyranids for conquest, and they fit a similar mold of an outside thread that no one can ally with. They had some unique gameplay mechanics relating to their synapse creatures and ability to infest planets, so I could see a Shadowlands faction in new L5R having some unique mechanics as well. Eh... if they add that mechanic, then the Crab and Phoenix should already have stuff in their design about opposing it (or using it themselves, since we're rewinding to an era when both Clans started -boringly- flirting with dark forces). I'm willing to speculate that we get some Shadowlands stuff, even in the core box... that is politically worthless, but militarily stout as a low-honor option- stuff like an Oni, or some goblins. And if they get factioned, I'd wager they're going to have a nearly impossible time winning political matchups, but might be militarily untouchable. My money is on the "heretical sect of Shinseism" being either a Kokujin (but please, for the love of God, rename him) led sect who discovered the Prophecies of Uikku, or the rise of Shourido. "Well mine points straight out, but that could be from the fat pushing it down..."
Doji Hotaru is the Crane Clan Champion, and she is the eldest child of Doji Satsume. We will re-introduce elements from the original canon as they become relevant in the new story. Perhaps if you call out to the spirits with an offering of blood, the answers will be revealed... There are undoubtedly forces in the Emerald Empire who are working in the name of the Dark Kami, but finding them will be difficult. The Kolat work best when they can work in obscurity. Surely the samurai in the Phoenix Clan would root out any shugenja who fell to the dark promises of maho. Harriers? I don't know what you're talking about. I do wonder, does anyone know if FFG also get the rights to Legend of the Burning Sands in the deal? That game had a lot of potential back in the day, but it came out around the time of the CCG bust and it also felt like it was missing an additional victory condition, plus the starter deck construction was awful back then. The Clan War is still far off; it's even earlier than that... more or less the initial time of the first edition of the RPG. The SCC hasn't happened yet and the Scorpion Clan is a member in good standing of the Empire. In fact, Shoju is best friends with the Hante!. 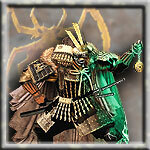 I only hope we get some glimpse of the Kuni and Yogo daimyos soon. More news about the Conflict phase. So far looking great! I was pleased to see this however! Always great to see Sahara back again, he even has no name, so he will always be Sahara to me. As an unaligned that looks to have a pretty solid ability, here's to hoping he will see more play in this new game! Daigotsu Sahara just got Rick And Morty'd into this new dimension what a time to be alive.